Kriti Sanon, who had a fear of dogs earlier, now is inseparable from her furball. 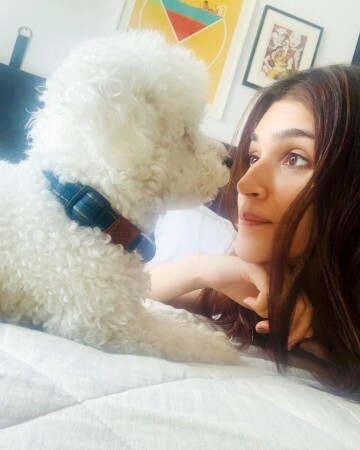 Kriti Sanon who often keeps her fans and followers updated with pictures and videos of her pet Disco, was very scared of dogs in the past. The actress, who had a fear of dogs earlier, now is inseparable from her furball. All thanks to her sister Nupur Sanon. Though the actress had started developing soft-corner for dogs while growing up, she has loved them but from a distance. After moving out from parent's house and her hometown Delhi, Kriti would miss her family and used to feel lonely at times as she stays alone with her sister Nupur in the city of dreams Mumbai. It was then, that Kriti was introduced to a family away from home in the form of Disco. Since then the actress has developed a strong affinity towards pets and now she's absolutely inseparable from her pet dog Disco. The actress is often seen posting pictures and funny videos with her 'furball'. Recently she had taken him on the sets where she was shooting. Amidst jampacked schedule, Kriti makes sure she spares time for her pet puppy. The actress has completed the shoot for Arjun Patiala, Housefull 4, Luka Chuppi and currently started shooting for her period drama 'Panipat'.